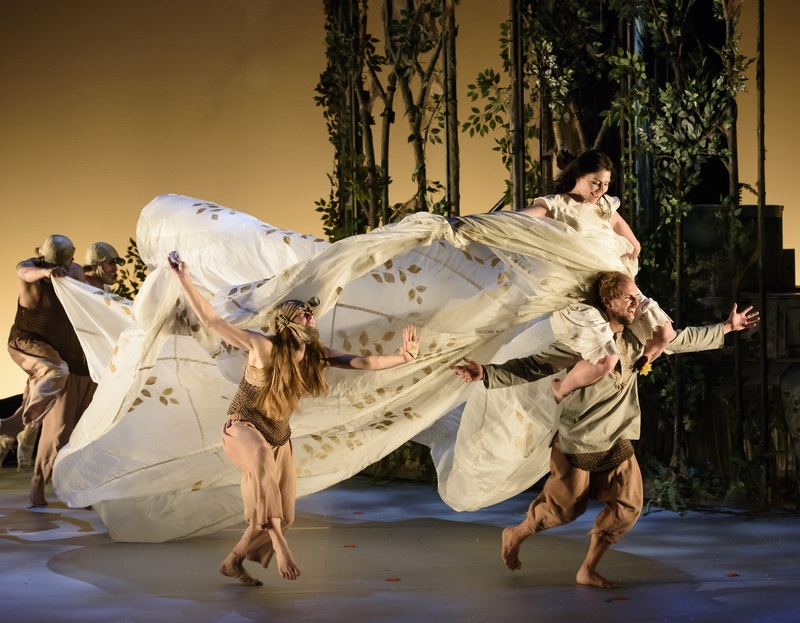 A new and exciting retelling of Snow White is coming to London’s premier dance house, Sadler’s Wells, created by UK’s leading contemporary dance company balletLORENT. balletLORENT is bringing a reimagined Snow White to Sadler’s Wells, how is this adaption different and what can audiences expect? We offer something very different to classical ballet companies, and the traditional contemporary dance aesthetic. Our production of Snow White offers a richly layered sense of theatre, with balletLORENT’s brilliant collaborators adding depth to everything the audience sees and hears. The wonderfully eclectic cast is supported by great lighting, set design, costume, a great number of props, narration, an orchestral score including a beautiful soprano, and, of course, very committed performances from our cast of dancers. Although the images we create are very filmic and fairytale-esque, it all comes together to look very natural, very real. The professional dancers are accompanied by a cast of local children from Vittoria Primary School, who perform the roles of the Palace children, the young Snow White, and woodland creatures in the forest. As a company, we are really good at storytelling, and choosing when to let dance take the lead role, or when to let the music, narration or the set design come to the fore. balletLORENT is an acclaimed contemporary dance company, what makes the company special? We are pretty unusual in having a very diverse group of dancers whose ages, training and backgrounds are very contrasting. It’s also quite a rare privilege to work with some dancers for 15 years or more. One of the most special things about our dancers is their selflessness and lack of ego. Because we often share the stage with children or other guest ensembles who haven’t had professional dance training, we often seek to use the dancers’ virtuosity in ways that propel the story, the image, or the emotion rather than show off how clever we all are. We are deliberately sitting outside of trying to impress our peers, and very focused on being able to offer something magical to audiences who may have had very limited experience of dance. Snow White is part of a trilogy of fairytales, what inspired you to recreate these? Emma Gladstone (now Dance Umbrella) and Alistair Spalding (Sadler’s Wells Artistic Director) suggested that we look at doing a fresh retelling of a classic fairytale after they programmed our original fairytale, Angelmoth at Christmas in 2008. It was an intriguing suggestion that grew in appeal after I did some research on the original Grimm tales, which became so vital as I re-read them as an adult. I fell in love with the story of Rapunzel, our first fairytale in this trilogy – and ever more so after Carol Ann Duffy (adapter) took the tale to a new place. It is creatively inspiring to relook at classic tales that have already been interpreted many times, but that are relatively untouched as dance theatre productions. As the artistic director and founder of balletLORENT, what is your vision for the company? The vision grows very organically with the changing world, and as my own life and circumstances change. The stories I want to share, and the emotions I want to provoke in the audience, are usually directly connected with things that I have been wrestling with or celebrating in my own life. It makes perfect sense to me to be making work for family audiences whilst I have two young children, who expose me to the their infant world and interests every day. I hope that the company continues on its path of integrity, growing audiences that find something satisfying and escapist in the work we present. Your company includes dancers from around the world and varied backgrounds, what do you look for in dancers? I really like the range – the different body types, physicalities, heights, ages and backgrounds. The dancers are all very individual and I find them all beautiful as people, inside and out. It could be anything from their hair, eyes, laughter, sense of humour, generosity of spirit, as well as their beautiful feet, loose back, strong centre, mobile neck… The list of what I look for is endless, but certainly they all have incredible stamina for detail, very brave, and good at trusting me, themselves and each other. I think that I need dancers who are genuinely inspiring, and enjoy having that creative responsibility. I don’t have a mannequin / robot relationship with dancers, and if any of them said to me “Show me what to do”, we wouldn’t get very far. As an award winning choreographer, how do you describe your choreographic language? I really like movement that looks easy and free, and is inspired by natural lines. However, it’s got very little to do with softness or release! I like a lot of power and strength propelling, sustaining or flying the movements, and the dancers put a lot of effort into making it look free falling. I think that the curves and shapes are very art nouveau, and I really love welding movement to set design, prop, costume and light. When we have children perform on stage with us, we all find their free, expressive and utterly committed physicality totally inspiring. What was your inspiration for Snow White, and how did you approach the choreographic process? There are many approaches – we storyboard the scenes and pilot ideas, such as Snow White having dinner with the miners at their house. The dancers will take direction continually throughout workshopping various ideas, and will contribute steps to a ball scene, or show me how they can climb a forest wall, or lift a child as if it were their feral pup. I react to what they offer visually, and am quite expressive about what I love, and don’t love. Our inspirations come from the collaborators – their music, words, lights, set and costume. As choreographer and artistic director can you describe a typical day? Like most choreographers, a typical day is spent making and rehearsing in the studio; in a theatre on tour; or in the office with meetings – all very different! There is certainly a lot more typing at a laptop than I would ever have imagined – but that is certainly unavoidable, especially when creating work for your own company. Inevitably there is a lot of written work to support the fundraising, artistic writing, board papers and marketing copy, and interviews to deliver. But I’m not alone – I have some fantastic colleages to collaborate with. A day in the studio feels very special. As the dancers are not full time, we really feel the importance of being together and making work. But equally, there is a lot of pressure to achieve a lot in a day, to not waste anytime. I’ve developed strategies to maintain productivity over the years, but I’m always open to improvement! On tour, we find ourselves discovering the nuances of a new stage and backstage, and connecting with a new group of children to work with as part of the Snow White cast. Or, it will be a familiar theatre – memories already filling the dressing rooms, confident about performing on that particular stage. It’s always a very full on day, but we are enjoying more and more the opportunity to do three or more shows in a venue, which is amazing. I always sit in the audience when I’m on tour, and learn about the work afresh from the vantage point of each new auditorium. As an inspiration particularly for other women to create their own companies and choreograph new works, what advice would you give others? It can take a long time to get noticed, to develop your own distinctive voice, getting knocked down repeatedly and having to get up again. It takes patience and tenacity- you really have to want it. There is something amazing about doing this line of work though, if you can put up with the rough bits. It is great to be able to give paid work to talented artists that you admire, and to create something that audiences across the UK find rewarding. But we all have to find our audience too, and accept where they are, and where they are not. I also think that you can’t necessarily choose to be a certain type of choreographer. Play to your strengths, and try to be kind. Learn more about balletLORENT and Snow White, being performed at Sadler’s Wells on 25 & 26 March.